So I have Clear coated all the armor in poly. it has worked great for now. Last thing to do is figure out a new harness and Poly the Helmet. The cool thing is that a year in you now know the weaknesses and strengths of the coatings and certain materials you used during the first time around and are now modifying your armor to be superior. I remember we talked about that a bit at Con. 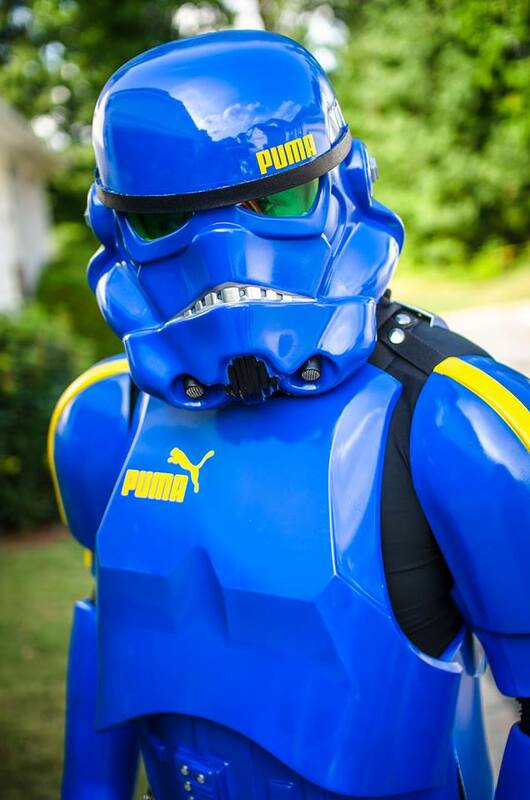 Sadly Puma Trooper will not be making and appearance this year. Due to the fact I will not have a room this year. Thigh piece with poly on it. So the Puma Trooper is Fixed and working for now and I will be bringing this to Con. So excited to be rocking the Puma trooper again for another year. Have you seen or talk to the Adidas Trooper, he's pretty cool peeps? Don't be afraid to become great. Yep. I have met him and hung out with him at several cons. I was inspired by him to make the Puma trooper armor. And i got his blessing before i started too. Then you must be cool peeps too.